By working at the neighborhood scale, designers and developers can more dramatically improve environmental performance and social equity. Working at the neighborhood scale allows for accelerated implementation of sustainability solutions. 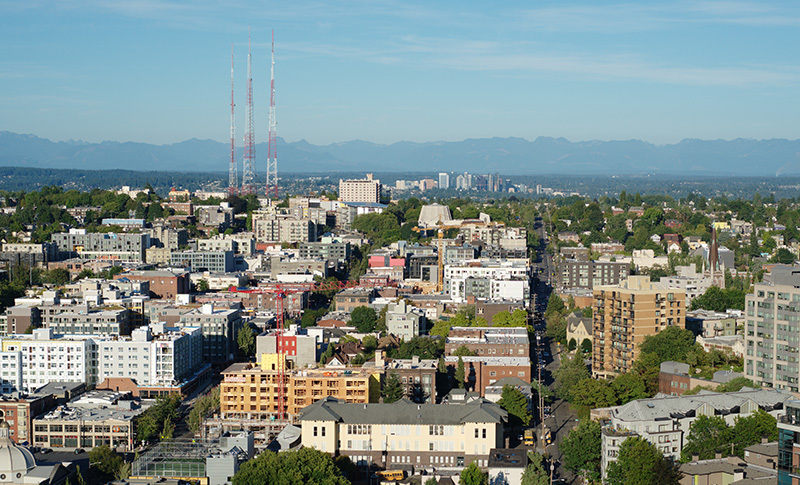 And community level projects like the Capitol Hill EcoDistrict in Seattle are working to make sustainable development more equitable. The building industry has set ambitious goals for sustainability and resilience, and is recognizing that a building-by-building approach is not enough. At the same time there is an increasing focus on making healthy, vibrant, and resilient communities accessible to all. “There’s certainly an urgency. I think people really understand that we’re the last generation that can make a difference if we act—and we can act and we need to act,” said Alicia Daniels Uhlig, director of Living Community Challenge + Policy at International Living Future Institute (ILFI). Uhlig has worked as an architect for more than 25 years and took lead of the Living Community Challenge program last year. She told BuildingGreen that when she first learned of the position she couldn’t help thinking about how 2015 had been the hottest year on record (before being surpassed by 2016). “Personally I needed to effect more change at a faster rate,” she said. This motivated her to shift to a position outside traditional architecture practice. And she says she doesn’t believe she is unique in this regard—many in the profession are feeling the same pressure to have a greater impact. One effect of this is a trend towards a district-scale approach to sustainable development based on the idea that by combining resources and coordinating efforts, communities can meet performance goals much more quickly. And because this approach involves more stakeholders in community development, it could make the process more equitable. What does this mean for the building industry? As focus shifts to district-scale efforts, building professionals may evolve the ways in which they work and adapt the services they provide. Designers especially may find that by engaging problems at a larger scale they’re able to generate better solutions.